7th September is an incredibly important day in Australia. I’m not talking about the general election. It’s the day, in 1936, that the last known thylacine died of exposure, locked out of its cage in a zoo in Hobart. In Australia, this is marked by National Threatened Species Day. In the Grant Museum, it’s Thylacine Day. 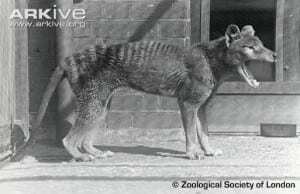 Thylacines – the half stripy wolf-shaped marsupials – are a regular feature on this blog because we have a pretty amazing collection of them. Two years ago today I made the point that their deliberate extinction at the hands of a cull promoted by the farming lobby was being echoed by a proposed badger cull here in the UK. In this past month those proposals have become reality, and I’m returning to the story today. Tasmanian sheep farmers accused thylacines of killing their livestock, and convinced the government of the time to introduce a cull which eventually wiped them out. The public had no reason to doubt their guilt and there was widespread support at the time. However, we now know that thylacines were not regular predators of sheep. The British farming lobby, led by the National Farmers Union, have managed to convince our government to cull badgers in Somerset and Gloucestershire. Unlike the case of the thylacines, the public have been told the evidence that science does not support the badger cull, and indeed could worsen the incidence of bovine Tuberculosis (bTB), which the cull is claimed to target. As a result of the evidence, and the evolution of our relationship with wildlife, the public overwhelmingly oppose the cull (indeed one petition which closed this morning has around 300,000 signatures – the highest response to any government petition). 1) The scientific evidence does not support the claim that the badger cull will effectively reduce bTB. 2) Scientific evidence supports the culling of deer to maintain healthy ecosystems. The thing is that over the last thousand or so years all of the big carnivores in the UK – wolves, lynx and bears – were driven to extinction by hunters and land-clearing (for farming). Wolves, lynx and bears eat deer. Deer eat saplings. Saplings grow in to trees. Trees make up forests. Most native wildlife lives in forests. Remove the carnivores >>> deer numbers go up >>> tree numbers go down >>> forests shrink >>> animals that live in forests can’t survive. Native British forest already barely remains, and deer in large numbers stop it regenerating, as well as making it shrink. Culling is necessary to save the ecosystem, as the science supports. Today we now know that thylacines weren’t responsible for the near-collapse of the Tasmanian sheep industry. It’s tempting to think that had that been publicly accepted 100 or 120 years ago we’d still have the largest marsupial carnivore of modern times. Today’s news disgracefully suggests otherwise. That the badger cull won’t effectively reduce bTB HAS been publicly accepted, but the National Farmers Union (who purportedly only represent 18% of British farmers) have managed to pressure the government into doing it anyway. So tonight raise a glass to the thylacine, whose tragic demise on the concrete floor of its freezing cage in the Southern Ocean was the final page of a tale of illegitimate government-backed culling. But when you picture that scene, don’t do so in the black and white of history, for somewhere in a wood in Somerset history is being repeated.